Another month has flown by and I’m sat here sweltering in our garden thinking about all the amazing blog posts I’ve enjoyed reading in June. As we move into the height of mid-summer I find I want to be spending as much time as possible playing outside with not-so-Baby B (his name is going to have to change soon!) Subsequently, what little free time I have has not been spent tapping at a keyboard. I think being in an office all day also means that by 7 or 8pm the last thing I want to do is start typing again! For example, I originally thought I’d do a weekly round up of blog posts I’d enjoyed but it looks like for now it’s monthly as I struggle to find any time to write posts. And this brings me to my first post, which was all about fitting blogging into our already busy lives. Franky’s post about how Crazy May turned into Crazy June spoke volumes to me and Mrs B. We often feel that we are running to stand still in our lives, like many many other parents with or without jobs. No one likes a moaner so we all tend to keep quiet and soldier on but it was good to read someone who is very successful in the blogging world admit that things had got on top of her and blogging had taken a bit of a back seat to the rest of life. I have said before and I’ll say it again – I am in awe of people who can write every day and not only that but fill their social profiles with cool photos and still make home made meals for their children. But I can’t. So I will continue to pootle along and accept that this may mean I am never going to be a pro-blogger. Well, I’m making the most of my time in the garden shed today so I will happily crack on and aim to post three times a week as per the Slow Blogging movement! Talking of blogging, June saw hundreds of ‘mummy bloggers’ descend on London for Britmums Live and Blogtacular. There were so many great reports about the event but I’ve chosen this one. This was Lisa’s first time at Britmums Live and she not only managed to overcome any feelings of being overwhlemed but also succeeded in capturing the spirit of the event in her post. The energy and excitement really shone through along with a sense of camaraderie from meeting other bloggers. 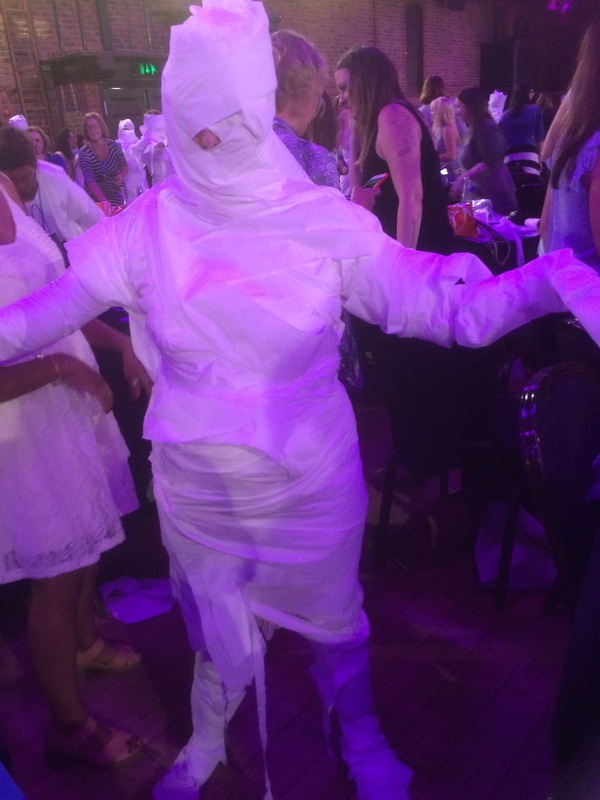 Not sure what was going on with wrapping people up in paper – looked like an 80s episode of Doctor Who! Anyway, the round up of sessions – from optimising social media, to marketing your writing and creating graphics for your blog – has certainly inspired me to go along next year. Which segues nicely into my next pick of the month! 3. Slouching Towards Thatcham | Should Britmums Live be doing more for dads? I had the pleasure of meeting some of the growing band of dad’s who blog at the Day of the Dad organised by Al from The Dad Network. At the event we talked about whether and how events for parenting and lifestyle bloggers could be more welcoming and appeal to dads/men. Tim wasn’t there so I didn’t get to meet him but I loved his thoughts on the various reasons why so few men attend Britmums and other blogging events. I agree that we don’t need to be getting into quotas! And that clearly most parenting and lifestyle bloggers are women so the event is appealing to its core audience. And yet there is an issue with a self-perpetuating cycle whereby men don’t think something is for them, so they don’t go, so there aren’t many men there, and this sends out the message that it’s not for them. I thought Tim’s suggestions were great and I hope someone at Britmums was listening! June is traditionally the start of holiday season and we were no exception as we soared out of the city for a week on a beautiful farm in Cornwall. Travelling and holidaying with children will always be a perennial post topic for many bloggers and the internet is creaking with tips on getting to where you need to be without wanting to pass your children to the oversized items section at check in. We flew for the first time with our boy in June and an hour was plenty! Was it easier when we were kids? Surely not! This lovely post set me thinking and talking to people about their holidays as children and I realised that our expectations of what a great holiday was were actually pretty low. If the basics were there – be it a beach, an adventure playground or in my case a fond memory of being 6 and spending ages going round and round a tiny race track in a battery powered car – holidays didn’t need to look like they’d popped out of a style magazine. Laura’s grainy shots of her family in sou’westers or at a cheesy disco made me realise that spending loads of money isn’t the key to a great trip with children. stories that are told time and time again round the dinner table and at family parties. that make the memories. And on our holiday my abiding memory will be of Little B (see – I’ve changed his name) toddling off at every given opportunity and us spending all our time chasing after him. We earned our cream teas! 5. Yellowbelly Mummy | Things that happened in the 80s – that we’d never get away with today. Finally, like most people I love a laugh and my comedy award for this month goes to Kate at YellowBelly Mummy who’s memories of the 80s and how wild they were in terms of total disregard for health and safety or wrapping kids up in cotton wool really struck a chord. As a teenager in the 80s some of her memories were about things I already thought were babyish at the time but I certainly recall spending hours making mix tapes (into the 90s in fact) and waiting with my mates, staring at the screen while the ZX Spectrum whirred and whistled its way through loading up JetSet Willy or Elite! Thankfully we now have the internet so we can all remind each other how dismal it was – through rose tinted specs (with dayglo flowers round the sides) naturally!